Assistant Secretary of Tourism Benito C. Bengzon Jr., head of the Philippine delegation, receives the award from Mr. Nigel Mayes, Vice-President & Commercial for Routes. 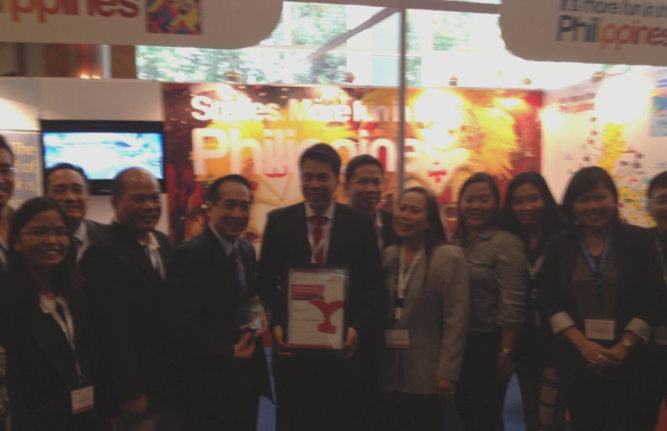 The Philippine Department of Tourism (DOT) was honored as highly commended in the Destination Marketing category during the recent 11th Routes Asia Conference and Exhibition held from March 17-19, 2013, at the Renaissance Mumbai Hotel, Mumbai, India. 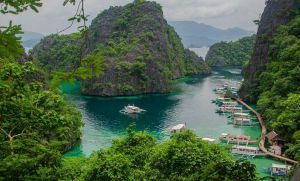 The DOT was among the five shortlisted finalists for the Best Destination Marketing Award, which included Tourism Australia, Okinawa Convention & Visitors Bureau, Singapore Tourism Board, and Tourism New Zealand. 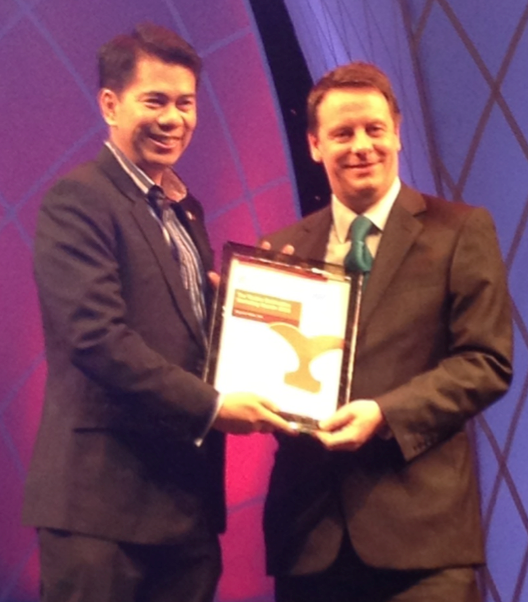 Tourism Australia was declared the winner of the first Routes Asia Destination Marketing Award. Routes, an organization focused entirely on aviation route development, spearheads and operates world-renowned airline and airport networking events attended by representatives from airline, airport, and tourism authorities, as well as aviation-related companies and investors. There is one global event (World Routes Development Forum) and several regional events held in key markets throughout the year in Asia, Africa, Europe, the Americas, and the CIS. Routes Asia 2013 gathered more than 700 key players in the airline and airport industry for the presentation of awards and strategic networking on air service development. The awards are given to “recognize and reward the highest standards of marketing activities.” In the past years, Routes Asia only honored airports, but this year marked the first time to split the awards into two categories—Under 20 Million and Over 20 Million passengers—and the first time to confer a tourism award for best destination marketer. Clark International Airport (CIA) also bested six other international airports and won the 2013 Routes Airport Marketing Award – Under 20 Million Passengers category. CIA was recognized by the airline community and industry experts for its marketing initiatives and effective growth in passenger traffic, aircraft movement, and revenues for the year 2012. The other shortlisted airports were the Auckland International Airport (Highly Commended), Bangalore International Airport, GMR Hyderabad International Airport, Juanda-Surabaya International Airport, Kansai International Airport, and Siem Reap Airport. Meanwhile, Singapore’s Changi Airport Group won in the Over 20 Million Passengers category. Changi was commended for reaching over 50 million passengers, securing five new air services, and introducing a product innovation. 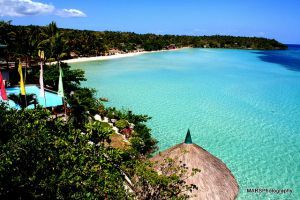 “This distinction marks another great leap for Philippine tourism and aviation. We owe this to the strong support from all our stakeholders, who have invested their resources and trust in our bid to make tourism work for everybody. This gives us a reason to celebrate, but more importantly to work harder in strengthening partnerships with various sectors to make the Philippine experience a worthwhile option for travelers and investors,” Secretary of Tourism Ramon R. Jimenez Jr. said. The Philippine contingent at the Routes Asia 2013, Mumbai, India. “Our participation in Routes Asia is in line with our efforts to improve international air access into the country, a key strategic direction in the National Tourism Development Plan,” said Assistant Secretary Benito C. Bengzon Jr. who was the head of the Philippine delegation. These recognitions came on the heels of the International Civil Aviation Organization (ICAO)’s recent lifting of significant safety concerns in the Philippine aviation system and the rationalization of the Common Carrier Tax, which are both expected to help regain the confidence of foreign carriers to reinstall direct services in the country.